Without a doubt, this summer the favorite activity in my house has been making slime! 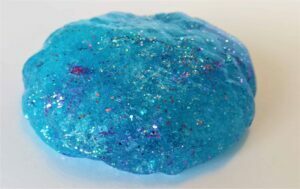 One of our favorite recipes was our Glitter Slime that I wrote about last month. But we’ve tried plenty of others too. Here’s a roundup of some of the best slime recipes from across the internet! Bored of making slime but still have loads of left over ingredients? Why not try making our Super Bouncy Balls! Fun and easy! We’ll start this Best Slime Recipes list off with an edible slime! This one is super fun and you don’t have to worry if your little one tries to eat it (in fact I challenge you to not try some yourself!). 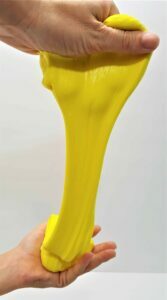 Karyn over at TeachBesideMe.com has this great recipe for edible slime that is easy, fun and safe. She also has recipes for Laffy Taffy and chocolate slime! This slime recipe from GrowingAJeweledRose.com is a little different as it uses Metamucil (yes… the fiber powder!) and Kool-aid (or food coloring). It’s not toxic if your child tries to eat it (although they don’t want to eat too much!). The method does require heating the mixture, so this is one that mom or dad need to make and then let the kids play with once it’s cooled. We had fun experimenting with different colors and mixing them together. Is this going to be your best slime recipe? The other sensation this summer in my household has been Beauty and the Beast (well, for my daughter and I anyway!). We fell in love with the new version of the Disney movie. So this recipe for Beauty and The Beast Slime from AsTheBunnyHops.com was a perfect way to combine our 2 summer obsessions! It uses the easy glue and borax recipe with the addition of fine gold glitter and rose shaped beads. My daughter’s favorite way to make different slime is to add different things to the basic slime recipe. One of her favorites is to make Crunchy Slime, like this recipe from Michael’s. By adding the pony beads to the slime, it gives it an awesome texture which is super fun to play with. A winner in my household! Note: you can also try polystyrene beads for extra squidgy crunch! There are quite a few recipes for Galaxy Slime available, but I love this one from Two-Daloo.com. 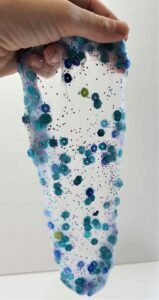 She uses liquid watercolors to color the slime and a variety of fine glitter to give it a sparkle. I’m all about anything glittery! This is also a borax-free recipe. So if you are worried about a reaction to borax, then this is a good one to follow. I’ve never had any problems with borax if you follow the instructions properly (I talk about it in my Glitter Slime article), but this is a good recipe if you want to be on the safe side. There you have it. My favorite slime recipes that we’ve tried so far… I’m sure we’ll be trying lots more before the summer is over! And then it’s Halloween… the perfect time to make slime! What are your favorite slime recipes?